In Access 2003 a form appears in its own self-contained, floating window and only takes up the space required to show all of its controls. In Access 2007 and 2010 a form takes up almost the whole screen, regardless of how many controls it contains. Fortunately you can change this setting to get your forms to appear in the older (and better!) style. In Access 2007 click the Office button, followed by Access Options. In Access 2010, click the File menu followed by Options. 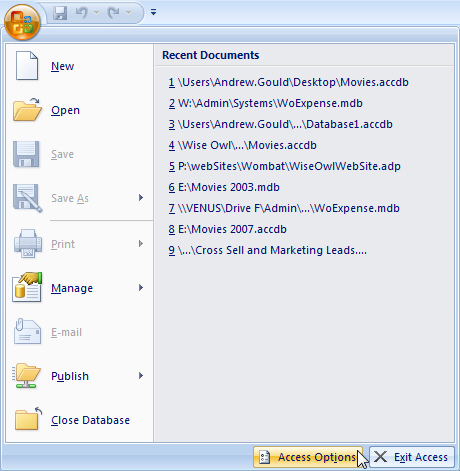 In Access 2007, click the Office button and then Access Options. Click the File menu and then choose Options. 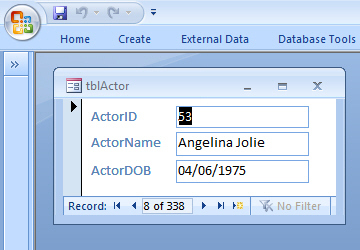 In the dialog box that appears, select the Current Database tab on the left hand side. 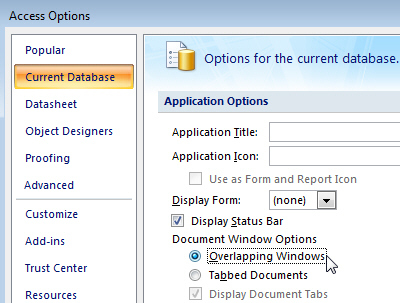 Find and select the option that says Overlapping Windows. Click the Current Database tab and then select the option shown next to the mouse cursor. Click OK on the dialog box and OK again on the message that appears. Close the database and reopen it. Your forms should now all appear as floating windows. And that's it! If you ever decide that you prefer the new style of forms, you can simply repeat the above process and choose Tabbed Documents instead of Overlapping Windows.